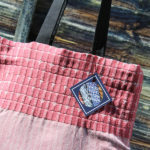 Chloe Scott produces woven designs inspired by rural and urban unnoticed details, looking at macro details and simple patterns. 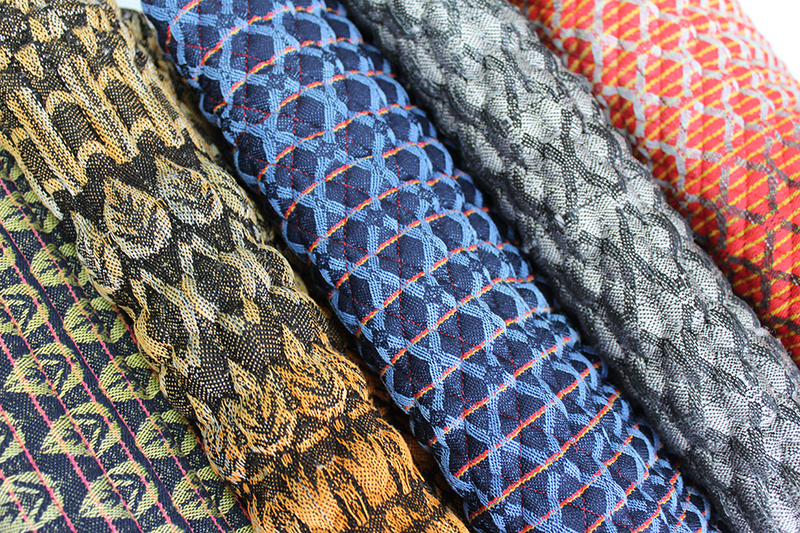 Fabrics explore graphic motifs, padded forms and strong colours in a sophisticated approach. In January 2018 Chloe decided to start her own woven design business to work on products, collections and commissions. 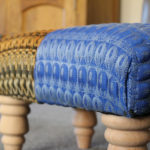 Currently she is developing her business to begin producing home products while she develops her underlying passion to produce fabrics aimed at automotive and home interior upholstery. She is also working with The Princes Trust to gain help and guidance while beginning her business. Since graduating last year Chloe has also exhibited her work across the UK and Internationally including New Designers (2017/2018), The Festival of Quilts, MoOD Brussels and The Sunbury Embroidery Gallery. This year Chloe has joined a shared studio space based in Norfolk, UK where she is beginning her woven journey to create new fabrics, collections and bespoke home products. She combines her love of photography and drawing to inform designs, creating graphic bold motifs which are translated onto the loom and into her woven fabrics. Each fabric is bespoke as the warp yarn is hand dip-dyed, allowing a gradual change in colour throughout many of the designs. 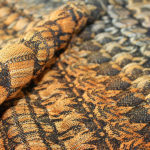 This also gives an added sense of shape and dimension to the fabric. Once on the loom, she considers use of yarn and materials to include intense bold colour and reflect on the inspiration, while thinking about what is suitable for the final product or design. Through the use of various yarns like cottons, polypropylene, viscose and silks this helps to create the smooth finish and the intricate patterns to her fabrics. Different techniques are used on the loom to create varied fabrics and Chloe creates large simple flat designs for simple products but also working on innovative padded structural designs with embossed forms and structures which come straight off the loom to create more luxury products and fabrics. 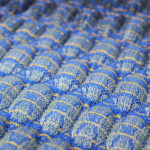 These innovative padded fabrics are created completely on the loom. 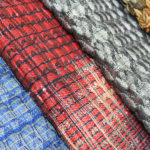 A double-cloth occasionally crossing over creates pockets which are filled by hand as the fabric is woven, giving the fabric a quilt like effect but without the stitching. 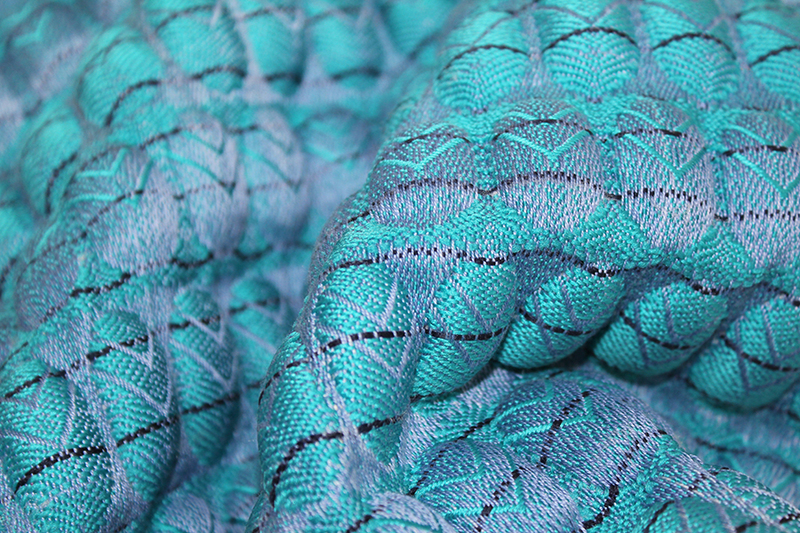 Through a growing passion from University, Chloe would like to develop her innovative fabrics for the automotive interior market, allowing colour and pattern to come inside the car. Chloe already chooses colours and patterns with automotive interiors in mind, thinking about the quality of the final fabrics. She wants to build on this process to create fabrics for custom Interiors. With more autonomous vehicles making their way into our future, Chloe wants to make the interiors a beautiful focus as we spend more and more time inside our cars. This entry was posted on Wednesday, July 25th, 2018 at 8:53 am	and is filed under General, New weave developments. You can follow any comments to this entry through the RSS 2.0 feed. You can leave a comment, or trackback.